Jumbo BobbinSaver? 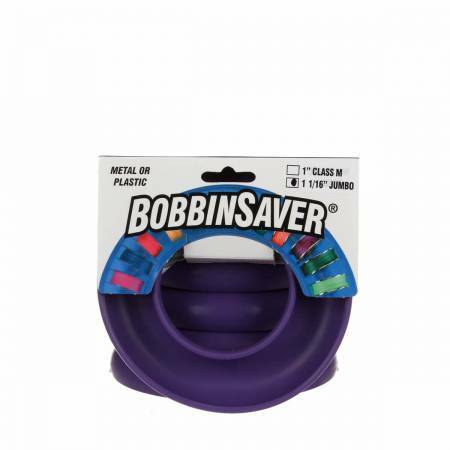 is a larger version of our well known BobbinSaver? which stores sewing machine bobbins together for easy retrieval. Made of the same flexible plastic, the new big brother expands to fit snugly around metal or plastic bobbin measuring at least 1 1/16" in diameter. This accommodates the Series 7 and 8 Bernina bobbins as well as some other industrial machine bobbins. Bobbins are held securely and threads will not tangle or unwind. Bobbins not included. Not compatible with Class M bobbins (look for the M sized BobbinSaver). Comes in red and purple. No color choice.